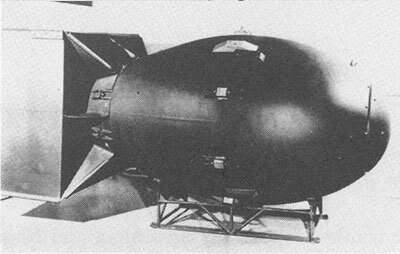 THE FIRST ATOMIC BOMBS: "Little Boy"and "Fat Man"
There were actually two new bombs, one using uranium, the other plutonium, with different triggering devices for each. 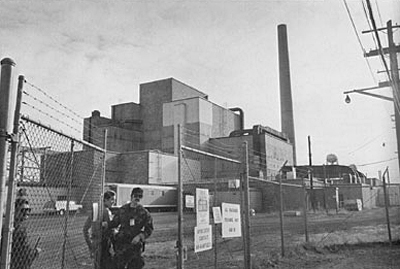 The main research and production sites were Los Alamos, New Mexico; Hanford, Washington; and Oak Ridge, Tennessee. The entire project operated under top secrecy, mobilizing top scientists and engineers, and at unprecedented high costs. 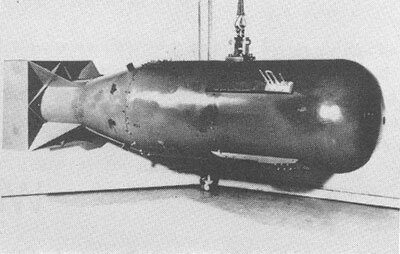 Nicknamed “Little Boy”(for President Franklin Roosevelt), the bomb’s size was 3 meters in length by 0.7 meter in diameter, using uranium 235 as its critical material. Inside a shortened smooth-bore 76.2 mm (3 in.) naval gun, a subcritical projectile of U-235 was fired at a subcritical target of U-235. At the moment of impact, a supercritical mass was formed, triggering a nuclear chain reaction, or atomic explosion. The gun barrel and heavy casing gave it a weight of over four metric tons (8,900 lbs). The subcritical material was an alloy called Oralloy, a code named derived from the secret laboratory at Oak Ridge, Tennessee, where it was fabricated. For use in the gun device, the fissile materials had to be made into geometric shapes capable of withstanding the violence of being shot down the gun’s tube, then stoipped abruptly at the target, and held together long enough to detonate. Nicknamed “Fat Man” (for England’s Prime Minister Winston Churchill), this bomb had a core of plutonium 239, was 3.5 meters in length by 1.5 meters in diameter, and it weighed 4.5 tons. Its plutonium core was surrounded by 64 explosive charges arranged in an inner and outer shell. The explosive charges were fabricated in geometrical shapes in a configuration similar to a soccer ball—an extremely difficult and demanding procedure. When the two shells were detonated, the shockwave slammed into a tamper surrounding the plutonium nucleus, causing a rapid increase in density that compressed the slightly sub-critical plutonium core, rapidly increasing its density, making it supercritical, thus exploding in a nuclear chain reaction.